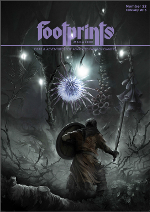 Footprints Issue #22 is out and its a killer, we've got a review of this free downloadable magazine on the Dark Corner Blog today. A look behind the curtain of mystery and adventure with this Old School Dragonfoot production. This issue features solid old school content, adventures, and more.